Juan Cristóbal says: – Yesterday, the good people of Curiepe staged a protest against the government for its heavy-handed actions in taking over the local police station last week. 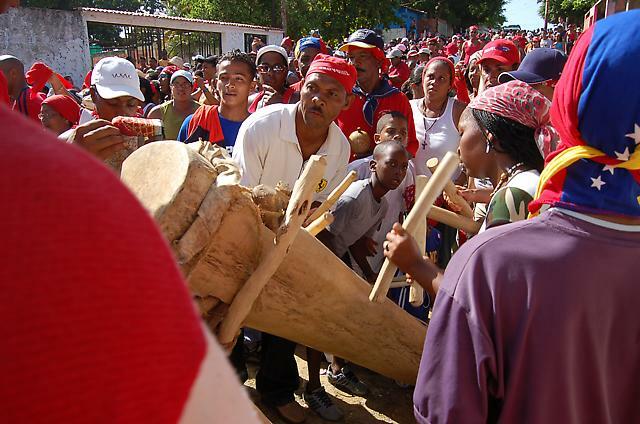 In traditional Curiepe style, the protest was accompanied by the beating of African drums that characterize this region. But the thing that made me a double-take was that the protest was held … in front of Miraflores Palace! Not only were they allowed to protest, but Chavez’s Minister Reyes Reyes actually came out and talked to them. Could it be that the days of “no protesting in front of Miraflores” and “government security zones” are finally over? Or will this prompt the government to double up on the barricades surrounding government facilities? Either way, good for them. Let’s hope the drums beat louder and more frequently. Post 67 of 100 … that picture is not from the protest but from the celebrations of the feast of Saint John the Baptist, the traditional holiday where the drum beating is at its apex.